Plants usually on rock. Stems compact to long-creeping, ascending to horizontal, usually branched; scales brown to tan or often bicolored with dark, central stripe and lighter margins, linear-subulate to lanceolate (rarely ovate), margins dentate, erose, or entire. Leaves monomorphic to somewhat dimorphic, clustered to widely scattered, 2–100 cm. Petiole brown, black, straw-colored, or gray, rounded, flattened or with single longitudinal groove adaxially, glabrous or pubescent, usually with a few scales at base, with single vascular bundle. Blade linear to ovate-deltate, 1–4-pinnate proximally, leathery or rarely somewhat herbaceous, abaxially glabrous, pubescent, or with hairlike scales scattered along costae, adaxially usually glabrous, dull, not striate; rachis straight or flexuous. Ultimate segments of blade usually stalked and free from costae, elliptic, lanceolate to linear, usually more than 4 mm wide; base rounded, truncate, or cordate; stalks often lustrous and dark colored; segment margins reflexed to form confluent, poorly defined, false indusia extending entire length of segment. Veins of ultimate segments free or rarely anastomosing, usually obscure, pinnately branched and divergent distally. False indusia greenish to whitish, narrow, clearly marginal, often concealing the sporangia. Sporangia scattered along veins near segment margins, containing 32 or 64 spores, often intermixed with glands, farina-producing. Spores brown to tan (rarely yellow), tetrahedral-globose, rugose or cristate, lacking prominent equatorial ridge. x = 29. Most in the Western Hemisphere, a small number in Asia, Africa, the Pacific Islands, and Australia. 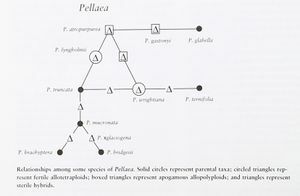 Pellaea in the broad sense is a diverse, poorly defined assemblage of xeric-adapted ferns (A. R. Smith 1981). Relationships among the North American, neotropical, and Eastern Hemisphere species are unclear, and it seems likely that the genus, as broadly construed by E. B. Copeland (1947) and R. M. Tryon and A. F. Tryon (1982), is polyphyletic. The species included here in Pellaea belong to a closely knit alliance that is usually recognized as a distinct section (sect. Pellaea). Although the inclusion of P. bridgesii in this group has been questioned (A. F. Tryon 1957), W. H. Wagner Jr. et al. (1983) have shown that the aberrant morphology of this species is simply an extreme expression of evolutionary trends commonly encountered in sect. Pellaea. Among Western Hemisphere cheilanthoid ferns, species of Pellaea show clear morphologic, chromosomal, and biochemical affinities to Argyrochosma and members of the Cheilanthes alabamensis complex. In fact, the glabrous species of Argyrochosma (A. jonesii and A. microphylla) are commonly misidentified as Pellaea. These species are easily recognizable, however, because they have a combination of concolored stem scales and small ultimate segments (less than 4 mm wide). Species ca. 40 (15 in the flora). Gastony, G. J. 1988. The Pellaea glabella complex: Electrophoretic evidence for the derivations of the agamosporous taxa and a revised taxonomy. Amer. Fern J. 78: 44--67. Tryon, A. F. 1957. A revision of the fern genus Pellaea section Pellaea. Ann. Missouri Bot. Gard. 44: 125--193. Tryon, A. F. 1968. Comparisons of sexual and apogamous races in the fern genus Pellaea. Rhodora 70: 1--24.